Per causa d'una instal·lació d'un d'aquests equips es van donar les circumstàncies per traslladar-me a viure a Tarragona l'any 1980. 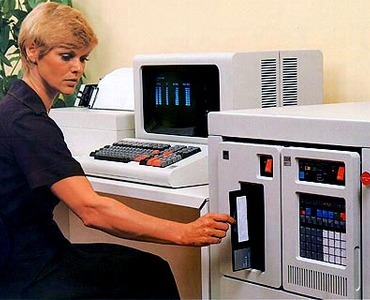 Announced by IBM's General Systems Division (GSD) on November 16, 1976, the IBM Series/1 was a small, general purpose computing system offering both communications and sensor-based capabilities. It also allowed users to attach a large number and variety of input and output devices, including custom-built devices for special application requirements. Initially provided in two versions -- the Model 3 (IBM 4953) and the Model 5 (IBM 4955) -- the Series/1 was offered on a purchase-only basis at prices ranging from $10,000 to $100,000 depending upon configuration. The 19-inch, rack-mountable units were available in 16K increments of memory from 16,384 to 65,536 bytes in the Model 3 and from 16,384 to 131,072 bytes in the Model 5. The Model 3 had a storage cycle time of 800 nanoseconds (billionths of a second) and the Model 5, of 660 nanoseconds. Also available at announcement were such devices as the IBM 4962 disk storage unit containing 9.3 million bytes of storage space, IBM 4964 diskette unit, IBM 4974 serial printer, IBM 4979 display station, IBM 4982 sensor input/output unit, IBM 4959 input/out expansion units, IBM 4999 battery backup unit, user attachment features and three communications features. The Series/1 was developed and manufactured at GSD's facility in Boca Raton, Fla. The first Series/1 machines were delivered to Citibank N.A. in New York City and to Quaker City Motor Parts in Middletown, Del. under a test marketing program begun in April 1976. 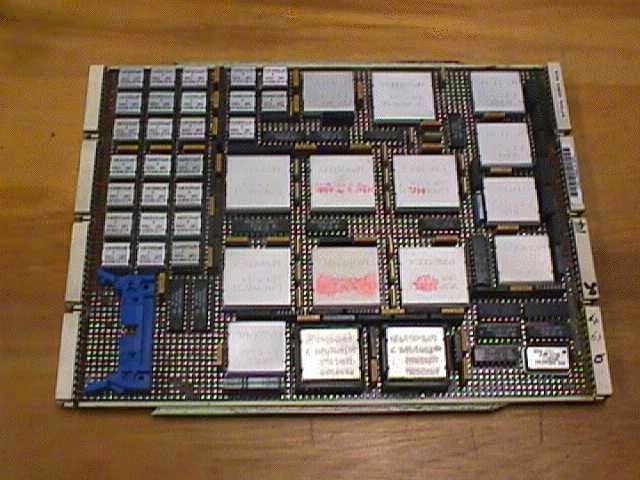 This is the CPU card, with 2MB of RAM and an FPU. The blue connector on the bottom left is to connect to the IPL and programmers consoles, the connectors on the edge next to the blue on is for connectors that attach memory cards.